Logitech’s G513 mechanical keyboard is in a class all its own. If you ever accidentally stumble upon The Bat Cave and catch Bruce Wayne playing Overwatch in his off time, this is the keyboard he’ll be using. For the past few weeks I’ve been using a pair of G513s as my daily driver for work and my after hours keyboard for gaming. It’s a beautifully designed gaming keyboard that hits all the right notes. And it maintains a small footprint with surprisingly few sacrifices. Best of all though, it proves you don’t have to give up comfort to have a top-tier gaming peripheral. I couldn’t help but smile the moment I unboxed the G513. It’s heavy. In fact, in a pinch, it could probably stop a bullet or be used as a sort of bludgeon. The brushed metal body, in ‘carbon’ color for the units I tested, looks modern and chic beneath black keys floating high above it. My usual gripe with keycaps sporting a high-profile is how much they wobble, but both the tactile and linear key versions of the G513 carbon (the silver model only supports tactile) were among the sturdiest I’ve tested. The G513 sacrifices the bloat that many keyboards have developed, in the form of dedicated media buttons, wheels, dials, and other extraneous do-dads. Instead you get the basics of a full keyboard, including the numpad. Included with the keyboard is a premium palm rest that’s, simply put, the best I’ve ever used. It has a solid, heavy bottom that mimics the keyboard’s design a bit holding it in place. And the memory foam is just thick enough to provide optimum comfort but not so thick my hands bounce around when I’m furiously typing away on one of my angry opinion pieces. And speaking of typing, Logitech claims its Romer-G switches deliver a 25 percent keystroke increase. I decided to put that to the test, so I put the G513 tactile and linear up against a stock Dell keyboard. With the stock Dell I pounded out a respectable 84 words per minute (WPM), but when switching to the G513 linear that went up to an even 90 and the tactile was even swifter, kicking my score up to 94 WPM (after adjusting for errors). That’s not precisely a 25 percent increase, but I’m usually slower on mechanical keyboards – the difference feels pretty big to me even if doesn’t look that way on paper. Logitech also ships the G513 with a set of replacement keys for QWERASD, and the 1-5 numbers. The replacements have a deeper groove in the keycap that makes them a bit grippier and entirely different from the other keys. I didn’t care much for it, but my hands don’t tend to wander when I’m gaming. Having the option, however, is what’s important. It’s another premium feature that makes the G513 a pro device. Having used both the tactile and linear versions I’m torn on which I prefer. The tactile is slightly noisier, which I like, as both are actually quieter than most mechanical keyboards I’ve used. But the linear feels a tiny bit smoother. For typing I’d lean towards former, but the linear seems to have a slight advantage in gaming, though that may just be in my head. 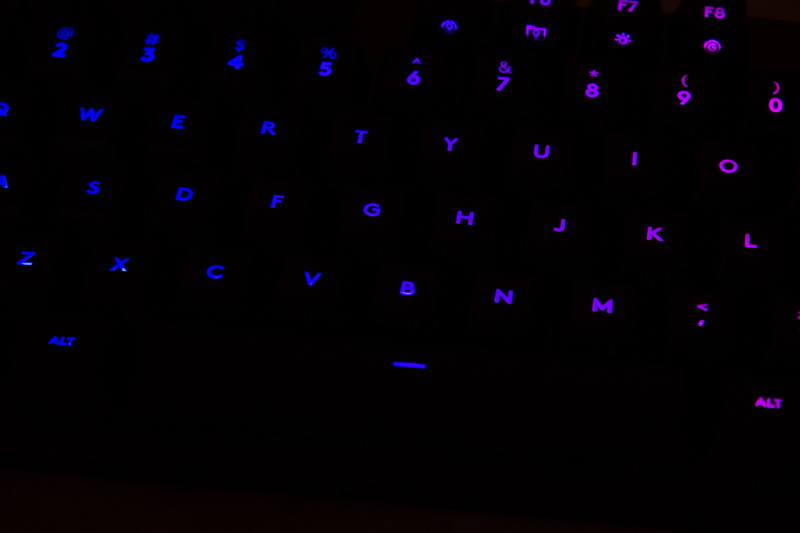 The one thing I haven’t talked about is the keyboard’s fancy lighting. It’s Romer-G keys were designed to let light pass through, so rather than have the underglow reminiscent of a tuner car, light shines through the center of the key. This means, if you turn the light off you can’t tell which key is which. 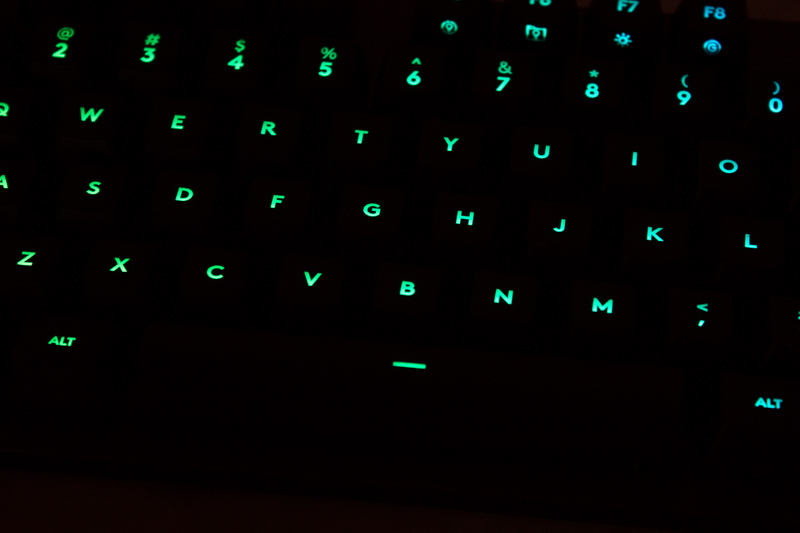 It’s not a problem while I’m gaming, nor while I’m typing, but for keys I don’t use all the time – especially those that can differ from one keyboard to the next – it is. I stumble to find the function or windows key sometimes. This likely won’t be a problem for people who love to leave the lights on and it’ll solve itself once you’ve used the keyboard enough to completely memorize its layout. I’m not a huge fan of brightly colored lights filling my gaming space – but I realize I’m in the minority. The Logitech software that controls the lights has been fantastic with previous keyboards, but at the time I tested it hadn’t been updated for the G513 yet. Still, the keyboard has some minimal on-board controls for the lighting that produce some pretty cool effects. It also has a gaming mode that minimizes the effects of errant keystrokes. We’ve all accidentally popped up a bunch of menus and windows while trying to game — this helps with that problem. The G513 is surprisingly good, even if you’ve used previous Logitech products before like the excellent G Pro and you know what to expect. Everything about it screams premium down to the braided cord with dual USB ends so you can plug a mouse directly into the keyboard and the aircraft-grade aluminum chassis. There are other options in the same price range but, as long as you don’t need a wireless keyboard, the G513 definitely deserves a long glance before you buy your next mechanical keyboard. The G513 comes in carbon (black) and silver, but as mentioned previously the silver version only comes with tactile switches. It retails for $149.99 and can purchased at Logitech’s website or on Amazon in both tactile and linear. Be on the lookout for our review of Logitech’s new G560 gaming speakers.